Spocket is a platform that connects suppliers and retailers, handling communication entirely. As a supplier, your products will be listed on Spocket for other online stores to sell. Retailers on Spocket will add your products to their store through the Spocket app. This way, Spocket is a means for growing sales! These retailers are looking for quality products with a unique style. You have amazing products that require a market, and what better market than Spocket? 2. Why should I join Spocket as a supplier? Spocket has more than 20,000 retailers on the platform and every single one of them is looking for products that they can sell. Spocket is the bridge that connects you to these retailers, and eventually, successful business. With Spocket, you erase the need to apply to retailers one-by-one and create agreements with each one manually. By connecting to Spocket, you automatically open up to a wide market that is high in demand for your awesome products. Marketing can take a backseat- as these retailers will be promoting your products, at no cost to you! In order to gain profits for their own store, retailers will be utilizing all forms of marketing- right from Facebook to emails, advertising your products to the max. The end product of this is the popularity of your products and a gradually increasing consumer base. Whether you’re a newbie or an established name in the industry, a few extra sales never caused any harm. Each product that is sold will bring you great profits, and a happy customer means a returning customer. 3. W‍hat type of products does Spocket require? 4. Which countries do retailers sell in? Again, we would love to add members from the Spocket family from over the globe. If your products are the right fit for us, you are welcome to join our ever-growing team! 1. What are the requirements to join? Considering Spocket is a dropshipping platform, and we want to provide the best service in the market, there are certain prerequisites to joining Spocket. You will need to offer a discount on your products. Remember, these are retailers that require your products and they will need a reasonable profit margin to be able to sell your products. This discounted cost on your products is the incentive they will have to stock your products. You will need to offer a flat shipping fee for domestic and international orders with tracking. If you have different rates for different regions that can be broadly differentiated- such as Europe, South America, South East Asia, East Asia, that will be the best. You can have different shipping rates for different products based on the size and weight of the product- that is no issue. We use Stripe to transfer funds to you. You must have a bank account in one of these countries to receive your sales money from Spocket. You agree to include the generated invoice by Spocket inside the shipping boxes and to not add any extra marketing material to the orders' packages. Pictures with white background preferred. The processing and shipping times must be followed. We want to provide a smooth service to our users, and make sure you receive sales from the customer more than once- and accurate shipping times would guarantee that! 2. Where do I apply? The first step to becoming a supplier on Spocket is filling out this short form: Sell on Spocket. Our supplier relationship team will review your application, and then reach out to you with the further steps! We look forward to seeing you on the platform! 3. How do i get my products listed on Spocket? Initially our team will do all the legwork. We will ask you to provide us a products CSV that will be used to import all your products to Spocket and get your initial account setup. 4. I have filled out the Spocket application, what will happen next? One of our team members will review your application and get back to you within 24 hours. Next steps include - importing all your products to Spocket and activating your account!! 5. Do I have to list all my products or I can list a subset of them? You can choose the products you wish to list on Spocket, which can be a subset of all the products you sell outside of Spocket. You can select the products you want to offer to Spocket and send us a CSV of these! 6. How do orders come in? Orders will come directly to your Spocket account and you will receive email notification for every order that comes in. 7. Can I bulk export all my orders? 8. How will I have to pack the products? The products will have to be sent out in neutral packages. By this, we mean that your branding will have to be absent from the packaging- the boxes or containers must be standard ones with no promotional material of yours. The reason for this is that our retailers are dropshipping, and would not want to reveal their sources. 9. What revenue will I receive? The Retailers will have your products on your store. When they receive an order for your product, the cost of the product that you have listed on Spocket and the shipping will be deducted from their account. For every order received for your products, you will be paid the product cost and shipping. Therefore, you will be paid $30. We process all payments every Friday. This payment will be a total for all the orders that you receive in the previous week that you have fulfilled and updated with tracking number. We use Stripe to process payments, and the payment will come directly to your bank account registered on Spocket. 11. How much discount do I need to offer the retailers, to sell on Spocket? The most successful suppliers are the ones that can offer 40% + discount as the higher profit margin attracts more retailers to market and sell their products. 12. Are there any hidden transaction costs that I should be aware of? No! There are no hidden transaction costs. 13. What if I want to stop selling my products on Spocket? In case you want to cancel your association with us, you will have to inform us at least 2 weeks prior. In this time, we will carry out the procedure of disabling your products and inform our retailers to stop carrying your products. All orders received till the expiration of the 2 weeks will have to be fulfilled by you. We will send you a message when you have been completely erased from our data, upon which you can cease to fulfill Spocket orders. You will have to choose from 3 return policies: you can either have no returns allowed, a 15 day return period, or a 30-day return period. For the 15 day or 30 day return policy, the customer will have to ship the product out to you within 15 or 30 days after the product has reached them. The retailer will contact us, we will check if the product falls within the return policy and then inform you. Once you receive the product, notify us-we will refund the customer. In case the customer simply changed their mind, they will have to pay for the return shipping fee. However, in case a damaged product or a wrong product is received, you will have to either refund the customer, or ship the right product (at your own expense). If you require the damaged/wrong product to be returned to you, you will have to send a prepaid shipping label to us, and we will send it to the customer. In all scenarios where a refund is involved, we will refund the customer, and add a negative balance to your account to take off the money from the next order. 15. How much does Spocket cost me? The best part is- Spocket is free of charge! You can simply add your products to our inventory and begin selling. We take zero commissions from orders and you receive the entire product cost and shipping! It is a transparent system- and there are no losses here! 16. Can I sell customizable products on Spocket? 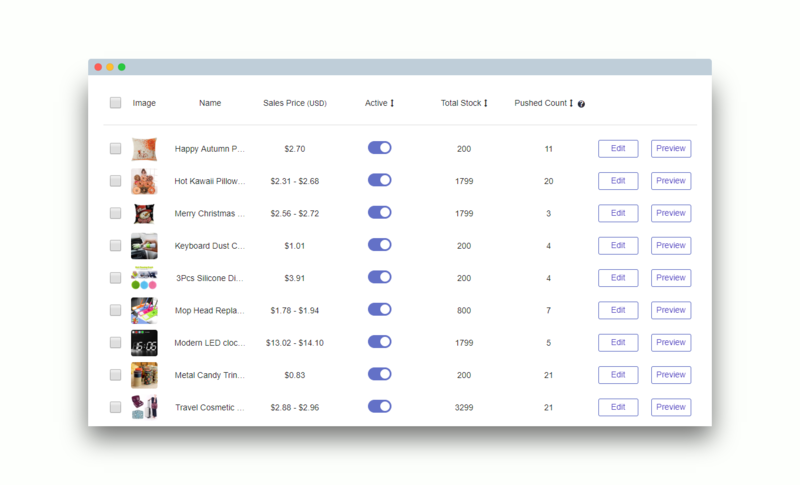 You can definitely sell customizable products on Spocket. You will have to explain what part of the product is customized in the description of the product. Also add ‘customizable’ in the title as well so people are aware. Eg. if the customer can have their name printed on a diary, explicitly mention this in the description, along with where exactly their name will appear (show this in the picture). Please make sure to give information about the font and size too! There will be a note attached with the order which will contain details about the personalization. For example, if you are selling custom bracelets, the note attached to the order will have the quote or name that should go on the bracelet. 17. Do I need to have a Stripe account to be eligible to sell? 1. Is it mandatory to offer International shipping? Simple answer-no! You can choose where you want your products to ship, but make sure to clarify these details before getting onboard! You can restrict shipping to domestic regions too. 2. What does flat rate shipping mean on Spocket? To make it easy for retailers to decide on profit margin & marketing budget, we require our suppliers to provide a flat rate shipping fee based on the type of the product and region it is being shipped too. This allows the retailer to analyze and mark-up the products as needed. 3. I have products of various sizes, how can I set shipping rates for those? That is not a problem at all! Once your product listings are imported to Spocket, we will work with you to set varying shipping rates based on size of the order and geographic location where it is shipping too. To make it easier, you can provide us a list of your major product categories, and shipping rate per category per geographic area. We will set that up for you when your account is being setup. 4. Who covers custom and taxes within Spocket? 1. How can I add my new collection to Spocket? Just like we added your products initially, we can add your new collection to Spocket using your products CSV. Just send a message with the CSV for the new collection and our tech team will get those products added to your account within 24 hours. 2. How can I update my inventory? We will need updates on the stock every week- so that orders do not have to be cancelled due to unavailability. We will require CSVs to be sent in every Monday. Also, if you decide to disable a product, please inform us immediately. We will let our retailers know. 3. How can I disable select products? Go to My Products List from the side menu. Find the product you wish to disable. Push the slider saying Active to Inactive. 10x your business with Spocket today!